The Vehicle Identification Number (VIN) provides clues as to a vehicle’s background, including the manufacturer, model year, and where it was built. Otherwise, it records the vehicle’s identity. VIN decoders assist dealerships to help verify, analyze and research the information contained in the VIN. 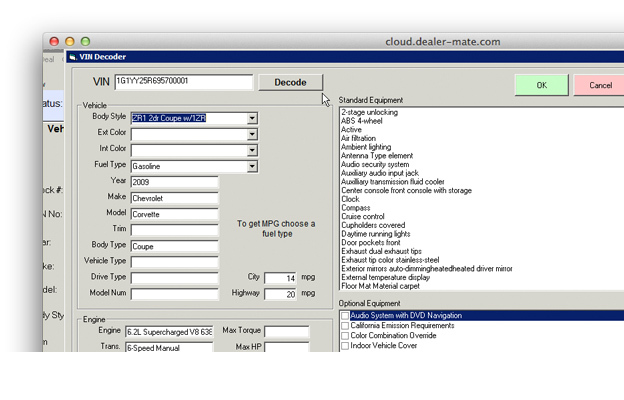 Dealer-Mate VIN Decoder provides decoding of the vehicles Year, Make, Model and Trim. It captures all relevant information with our VIN explosion capability. The operation is simple, enter the VIN number and click decode. That’s all. Enjoy received information. Instant online VIN report information on your screen. To get the most out of your data, it must be real-time to allow you to react in real-time.